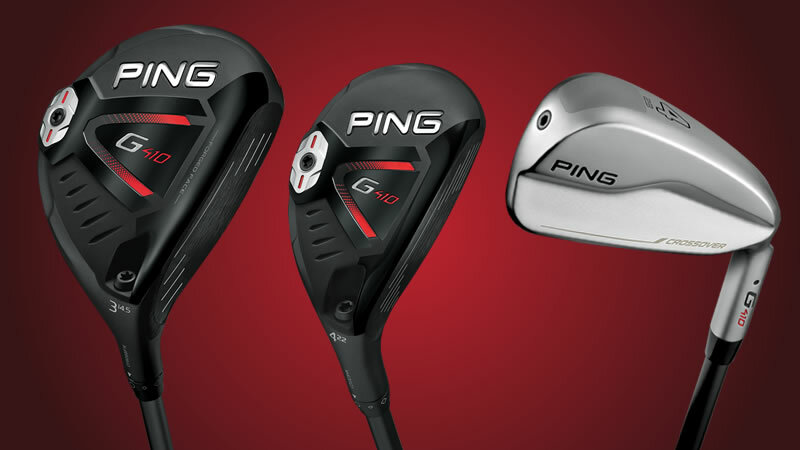 With an emphasis on speed-generating face technology, maximized MOI’s and added adjustability, PING today introduced the G410 fairway woods, hybrids and crossovers to ensure golfers have multiple options to properly gap their sets. The new custom-fit, custom-built equipment is available for pre-order at authorized PING golf shops around the world beginning today. To maximize distance in the G410 fairway woods, hybrids and crossovers, PING has employed C300 maraging steel as the face material. One of the strongest alloys in the world, maraging steel is commonly used in the aerospace industry, where strength and flexibility are necessities. It’s those properties that also make it an ideal face material to deliver more flexing for faster ball speeds that launch shots farther and higher. “With maraging steel, we have a material that allows us to go extremely thin with the face to give us the faster ball-speed gains we’re seeking for more distance and higher launch. The results have been amazing as we’re seeing face flexing equal to the thickness of the face,” said Solheim. In the G410 fairway woods, a low-back CG and high-density tungsten weight positioned at the extreme boundary of the head provides greater stability and forgiveness. A larger profile and high-density tungsten back weight in the G410 hybrid drive the MOI higher to ensure golfers the forgiveness they require while launching the ball higher. The G410 crossover, which has been streamlined to provide more iron-like performance, relies on a 30-gram dual-density tungsten toe weight to maximize forgiveness. The addition of a patented, eight-setting adjustable hosel to the hybrid greatly expands the fitting options to ensure proper gapping for golfers who rely on hybrids as mid- and long-iron replacements. The lightweight and aerodynamic adjustable hosel, which is also in the G410 fairway woods, offers loft (0, +1⁰, +1.5⁰, -1⁰, -1.5⁰) and lie adjustments (including up to 3⁰ flatter than standard) to optimize ball flight. Powered by a forged, maraging-steel face, the G410 fairway woods are engineered to launch the ball easily and deliver faster ball speeds on a penetrating trajectory that maximizes distance. PING engineers positioned the low-back CG slightly forward of the G400 model to deliver more energy from the shallower face while providing greater stability. Eight fitting positions in the new lightweight, aerodynamic hosel sleeve enable golfers to tune their trajectories through loft and lie adjustments. Three models (Std., SFT and LST) ensure an option to fit every golfer. More heel-side weighting and a lighter swing weight help square the face to create right-to-left shot bend (RH golfers). The heads are slightly larger to drive the MOI higher, and lofts are 1.5˚ higher to produce easier launch. The all-new, slightly smaller head has a CG slightly lower and more forward than the standard head to launch shots higher with less spin, resulting in longer shots that get airborne easily, a good fitting option for faster swing speeds and high-spin golfers. Our first-ever adjustable hybrid allows golfers to customize their ball flight eight different ways through loft (+- 1.5˚) and lie combinations for consistently better results. Thinner and more flexible, the maraging-steel face generates faster ball speeds and higher launch. A larger profile and high-density back weight provide added stability and elevate MOI for more forgiveness. With a thin, maraging-steel face for faster ball speeds and a 30-gram dual-density tungsten toe weight to increase the MOI, the G410 Crossover combines the precision and control of an iron with the speed and forgiveness of a hybrid. The G410 design is significantly shorter heel to toe and narrower in the sole than the G400. Available in 2, 3 and 4, the stainless-steel head sets up square and offers a clean, premium look with the gearing properties of an iron to allow precision shot making. To ensure a solid feel and sound, the internal ribs are engineered to help stiffen the clubhead body.